Hit the bottle and smash it in pieces! Lateset version 1.5 includes also some glazed pottery items such as pots, jugs, plates and bowls. Ever been frustrated to see a bottle fly away like a ping-pong ball when get hit? Then you should try this. Those who value realism and immersion, or just want to have fun making disorder and leaving a mess of broken glass behind them will certainly appreciate this mod. Be careful what you break, people will not appreciate you making disorder in public areas such as inns, guildhalls or their home. 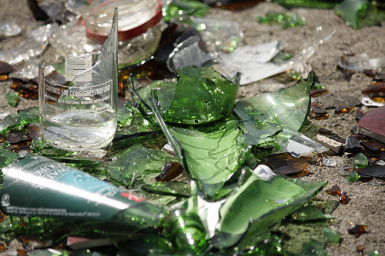 You can be caught and put in jail for this act of vandalism, even if the bottles you break belong to you. You can also grab broken bottle(usually ‘Z’ button, or by holding activate button) and stab someone with it. Works only for wine bottles. Mead bottles are too small and too bulky to hold it in your hand. Note for sneaky characters, enemies can hear the noise of the smashed bottle. Currently works for all kind of wines, meads, ale and empty wine bottles. prevent a total desolation. And to avoid NPCs sitting at the empty tables, and eating food served in the invisible plates. Latest version 1.5 is now availible! -Added support for some glazed pottery items(pots, bowls, plates and jugs). And implemented a autoreparation system for this items. 1:Unpack the contents of the archive to your “Skyrim\Data\“ folder. 2:Check esp file in mod manager. By default broken glass debris lifetime is set to 24 hours game-time. To change it, while in game toggle the console by pressing “~” and type in command line set CleanUpTimer to #num# replacing #num# by a number of in game hours you wish(be reasonable). That’s it, savegame and play. If you use any other mods that modify alcohols or empty bottles be sure to load destructible_bottles.esp the last otherwise it might not work. All feedback and suggestions are welcome. But please read following information before posting a comments. *Note: Unrelenting power can explode the bottles but there is still a good chance that a bottle survive and will be just pushed away. Explosive power of you thu'um will need some space to work properly. On my pretty old PC I didn’t notice any performances impact. But keep in mind that every glass shard is a little mesh with its own collision data, so your CPU will have some extra work to do. In case if you spawn thousands of bottles through the command line in the small room and cast a blizzard spell, I take no responsibility of what will happen.